A martyr is someone who has publicly expressed their faith in God and refuses to denounce their faith, even in the face of death. The word itself simply means “a witness” but in time, since so many witnesses were murdered for their faith, martyr became a synonym for a witness. Stephen, a deacon in the early church, was the first martyr recorded in the New Testament church (Acts 7:54-6). He not only refused to deny Christ, He gave one of the greatest apologetic sermons ever, proving the fulfillment of Christ as the long awaited Messiah (Acts 7:1-53). After hearing Stephen’s sound, biblical explanation that Jesus is the Christ, “they were enraged, and they ground their teeth at him” (Acts 7:54) and “cried out with a loud voice and stopped their ears and rushed together at him. Then they cast him out of the city and stoned him” (Acts 7:57-58). It wouldn’t be long before others would likewise be martyred. The Bible actually mentions martyrs only once and it’s found in Revelation 17:6 where the Apostle John wrote “And I saw the woman, drunk with the blood of the saints, the blood of the martyrs of Jesus. When I saw her, I marveled greatly.” This takes place during a severe persecution of the believers in Christ and the woman, was satanic forces of darkness that has long since tried to extinguish every last Christian but the truth is, all the enemy is doing is to speeding up the day that they’re no longer in the flesh or body but they’re present with the Lord (2 Cor 5:8) and how can that be bad, really? 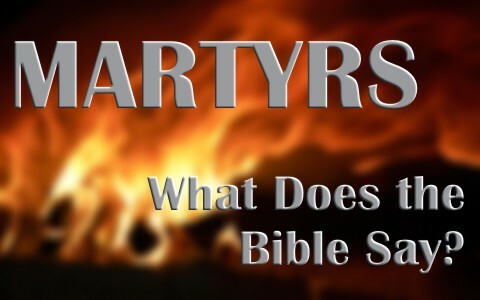 Even though the Bible doesn’t expressly use the word martyr very often, it is obvious there were many and we don’t have to look very far to find Scriptures to support that fact. “conquered kingdoms, enforced justice, obtained promises, stopped the mouths of lions, quenched the power of fire, escaped the edge of the sword, were made strong out of weakness, became mighty in war, put foreign armies to flight. Women received back their dead by resurrection. Some were tortured, refusing to accept release, so that they might rise again to a better life. Others suffered mocking and flogging, and even chains and imprisonment. They were stoned, they were sawed in two, they were killed with the sword. They went about in skins of sheep and goats, destitute, afflicted, mistreated— of whom the world was not worthy—wandering about in deserts and mountains, and in dens and caves of the earth” (Heb 11:33-38). Obviously if someone is sawed in half, they are martyred for their faith but so too were many who died from stoning’s, floggings, beatings, imprisonment, and yes, crucifixion today in some places hostile to Christianity. Even though there martyrs were “commended through their faith” they persisted even though they “did not receive what was promised” (Heb 11:39) but all that’s changed for them now. They are with the Lord. We shouldn’t be surprised by being persecuted but neither should we be obnoxious and force unbelievers who hate us for our faith by cramming Jesus down their throat, however the day is coming, and in much of the world, it has already come, where “They will put you out of the synagogues. Indeed, the hour is coming when whoever kills you will think he is offering service to God” (John 16:2). The last century has had infinitely more martyrs than in the previous 19 centuries combined and it’s getting worse, day by day. Jesus warned His disciples but this warning surely applies to us too, where He said “they will deliver you up to tribulation and put you to death, and you will be hated by all nations for my name’s sake” (Matt 24:9). It is Jesus in us Who they hate, not as much us, but not to the exclusion of hating us so we must remember that “all these things they will do to you on account of my name, because they do not know him who sent me” (John 15:21). We can’t take it personal. It’s the message they hate, not so much the messenger. Foxe’s Book of Martyrs by John Foxe should tell you a lot more about the ancient martyrs and many of the most recent but we can also see all the prophets that were mentioned in Hebrews 11 and see that martyrdom is nothing new. Many of the evil kings of a disobedient Israel or Judah killed many a prophet. That qualifies them for being a martyr. How many today cry out like the psalmist of old, as he wrote “O LORD, how long shall the wicked, how long shall the wicked exult” (Psalm 94:3)? In all of the evil kingdoms of the god of this world, (2 Cor 4:3-4) they “found the blood of prophets and of saints, and of all who have been slain on earth” but God will avenge them someday. It’s not for us to seek revenge but leave true and perfect justice to a righteous and holy God. We can trust Him; He will get it right. Us? Not so much. Next post: What Is The 2nd (Second) Commandment In The Bible?